In just half a century, plastic has moved from being a symbol of modern domestic bliss to a magnet for derogatory adjectives. 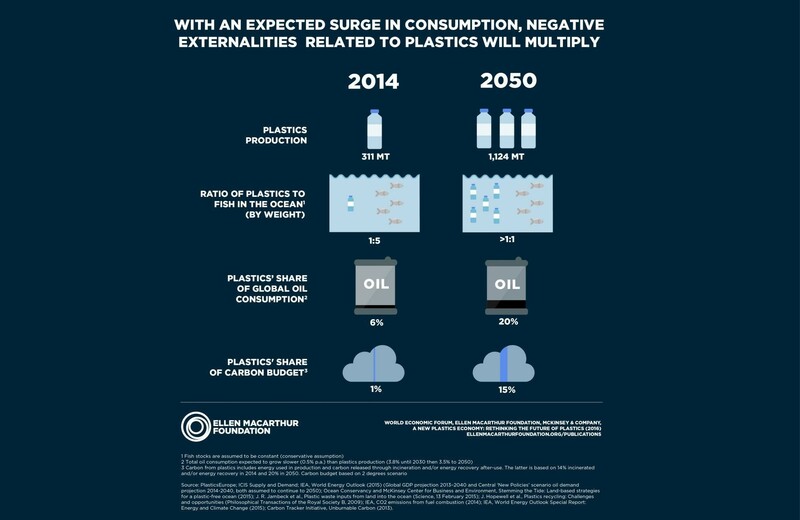 As eight million tons of it enter the ocean each year, there is an urgent demand to reconcile plastic’s undeniable functionality within a system that can work for the long-term, protect the environment, and avoid the loss of valuable material. Packaging is plastic’s single biggest application globally. It impacts our lives on a daily basis. Over the past 50 years, we have moved from reusable solutions to disposable, single-use items. But the recycling system hasn’t kept pace. Today, just 2% of the plastic on the market is turned into new packaging. Yet there are encouraging signs that both governments and industry are embarking on a radical transformation of the take-make-dispose plastics system, towards one that is circular by design. In just the first weeks of 2018, the European Commission announced its plastics strategy; France made the ambitious commitment to recycle 100% of all plastics by 2025; and the UK announced a 25-year environment plan with a major focus on moving away from throwaway plastics. Dozens of other regulatory measures have been introduced by cities, countries, and international institutions across the world over the past months. Industry is also taking action. Unilever has pledged to use 100% reusable, recyclable or compostable plastic packaging by 2025. During the 2018 World Economic Forum, the Ellen MacArthur Foundation announced that 10 more leading brands, retailers and packaging companies have made a similar commitment, with some also aiming at ambitious recycled content targets. These are all clear signs of growing momentum towards a solution. Yet in order to kick the plastics system into the 21st century, we need even more action by key actors within the system. 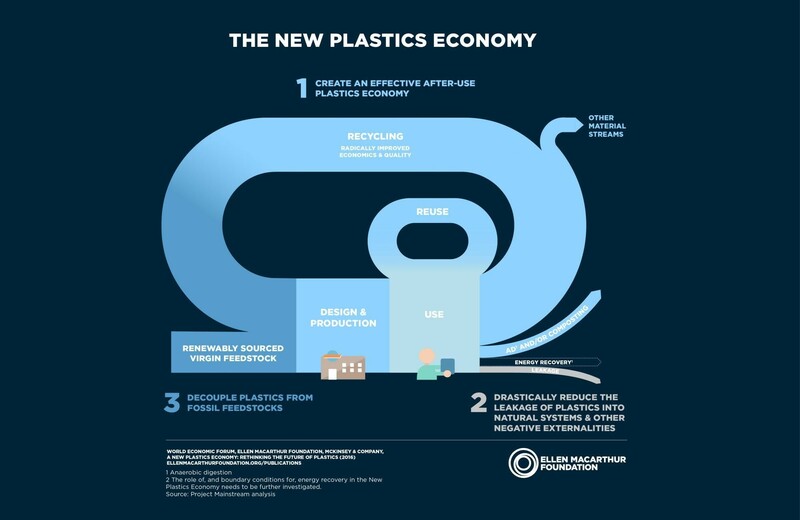 Businesses, in particular, could do four things to accelerate the shift towards a circular economy for plastics, keeping them as a valuable material in the economy and out of the ocean. First, while many businesses and governments are focused on recycling, it is only part of the story. There is an urgent need to look beyond it. We have a collective responsibility to question aspects of the plastics system that seem inevitable. For example, do we still want disposable carrier bags, given that they are burned or sent to landfill after a few minutes of use? Investing in innovative ways of delivering products to people without generating plastics waste can help solve this challenge and provide a $10 billion global opportunity. Second, more companies who put plastic packaging on the market ought to design their packaging while keeping in mind what happens to it after use. They should follow the lead of brands who have already made pledges to use 100% reusable, recyclable or compostable plastic packaging. Third, businesses need to define collaboratively a “Global Plastics Protocol” to provide common direction and definitions. The current system is too lenient and ambiguous. Terms such as “bioplastic” or “recyclable” can create confusion, and, in the worst case scenario, constitute a safe haven for greenwashing. Such a protocol could also help industry align on material choices, guaranteeing that only compatible materials that can either be recycled, reused or safely biodegraded make the final list. Finally, a constructive dialogue between industry and policymakers is a prerequisite to progress. Policymakers are essential actors in providing the infrastructure and creating the enabling regulatory landscape for a circular economy to develop. Too often in the past, industry and government have been pursuing different, and sometimes conflicting, agendas. Business leaders need to engage positively with governments on the required policies to shift the system - for example, in the implementation of effective extended producer responsibility schemes. 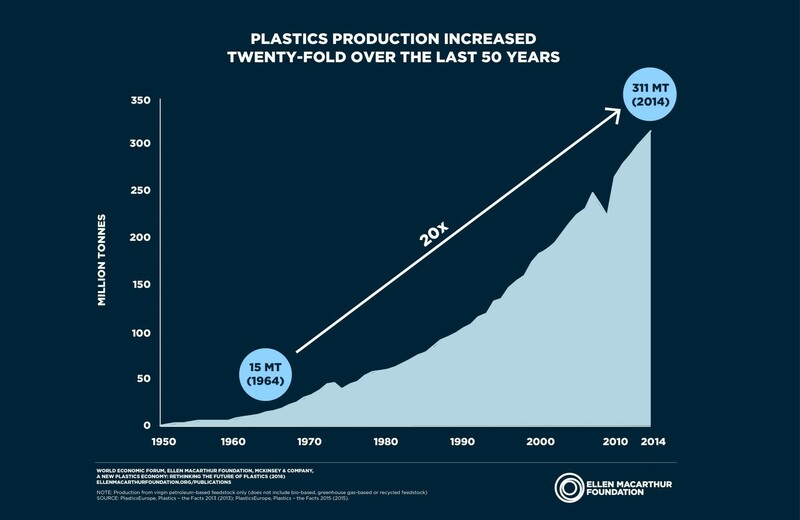 Given the scale of the plastics problem, our models of production and consumption deserve a shock. We need to join forces to initiate it. When we do, it will reveal economic - as well as environmental - benefits that we are currently overlooking.